The Van Avery Prep alumni community encompasses a diverse network of leaders across the country and around the world. Our graduates enjoy success in a variety of fields from teachers and lawyers to doctors, CEO's and humanitarians. Please read below as several graduates share how their experience at Van Avery Prep played a key role in their achievements today. I will always appreciate Van Avery Prep for providing me so many of the wonderful experiences of my childhood and fostering so many lifelong friendships with both my teachers and fellow classmates. My experience at Van Avery Prep helped to prepare me for my journey by providing me a solid foundation for my academic pursuits while also allowing me quality opportunities to become a well-rounded individual. My love of learning was nurtured by the quality of the teaching staff, small class sizes, the ability to challenge myself with advanced courses, and opportunities to apply my learning outside of the classroom through programs like Science Olympiad and the QuickScience Competition. At Van Avery Prep, I was able to participate in a wide variety of sports teams, which fostered my competitive spirit and taught me valuable lessons of teamwork and perseverance. Having played 4 years on the varsity women’s basketball team at John Hopkins University, it was those lessons learned in my early years at Van Avery Prep that I carried with me through high school and collegiate athletics. Van Avery made education personal. I am reminded of a science class where at one point a fellow student (a friend to this day) and I were curious beyond the lesson. The teacher took us aside and fostered our curiosity despite also having other students to attend to. The questions took a turn towards gas dynamics in space (rather niche in hind-sight for eighth grade). To explain these concepts, she invited us back after school. There she set up demonstrations to visualize concepts that are hard to imagine (space is still hard to understand to this day). That attention and facilitation is what propelled us in fascinating directions. One of my classmates from that instance developed a passion for chemistry and graduated with honors in the subject from college years later. From there he went on to do research at a top cancer lab, create a start-up from his chemistry knowledge and passion, and start a career in the field. The passion for learning I developed at Van Avery has led me around the world. The doors that opened with academic success brought me to Maryland, Korea, England, and Silicon Valley. Moreover, I find myself surrounded with people of passion and ambition everywhere I go. Cultivating drive and maintaining curiosity are two of the many seeds that Van Avery helped sow and nurture. Harvesting the fruit is pretty sweet! Arguably just as important are the relationships. To this day my closest friends are those I sat with at lunch since the first grade. When I graduated from college across the country, two VAP grads made the trip across the country to be there. These are the people that are family through and through. Masters Degree: The George Washington University, Washington D.C. Simply put, Van Avery Prep hardwired excellence in me as a child. They built the foundation for me to create a successful life by emphasizing the importance of believing in yourself and knowing that as an Eagle, you could do anything you put your mind to. My undergraduate degree is in Business Administration with an emphasis in General Management. My graduate studies are in Health Administration. I am currently working in Washington D.C. at The George Washington University Hospital while I complete my master’s degree. Within a year’s time I will be accepted as an administrative fellow at a facility of my choosing anywhere in the country. Van Avery Prep helped me develop leadership skills and fostered a general feeling of confidence to go after lofty goals. I believe that is the best thing they could have ever done for me growing up. Technical skills can always be taught, but attitude must be developed from an early age and I believe this is the competitive advantage Van Avery Prep afforded me. 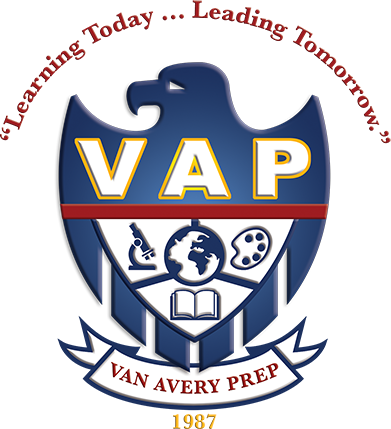 If I had children, I would certainly not hesitate in sending them to Van Avery Prep so that they too could benefit from growing up in a premium-learning environment. After receiving acceptance letters from all the UC colleges I decided on UC Santa Barbara where I graduated with a Bachelors Degree in Applied Mathematics with a minor in Statistics. After college, I accepted a position as an engineer at Raytheon Integrated Defense where I work on the combat system for Navy ships providing defense mechanisms. I truly believe the education experience I received from Van Avery Prep prepared me for the obstacles I would face in life. The small class sizes provided me with more one-on-one interaction with the teachers who encouraged my love of learning. I especially took advantage of the advance math classes available at Van Avery Prep and I believe this propelled me further providing me with an advantage over other students my age that attended other schools. Besides their strong academic program, Van Avery Prep provided every student the opportunity to participate in sports programs where they learned the importance of teamwork and developed leadership skills. I attribute my preparedness for college to my elementary education at Van Avery Prep. I am a co-owner of LoveStone Talent Agency were I am both a talent agent and entertainment attorney. We represent actors and models in commercials, TV and film. During my elementary years at Van Avery Prep I was exposed to numerous musical productions and plays that I believe led to my pursuit of a career in Film and Television. VAP offered a better overall elementary education helping facilitate functional learning that translated over to my legal education. With small class sizes providing for more individualized attention for students, the teachers at Van Avery Prep focused on helping students with time management, problem solving and successful approaches to learning. I attribute my preparedness for college to the valuable study skills and accountability instilled in me at Van Avery Prep. I currently attend the University of New Mexico on a full scholarship. I am pursuing a Bachelor of Science Degree in Biology, minoring in Chemistry and I am also enrolled in the honor’s college and receiving an Honor’s Distinction. At Van Avery Prep I was able to receive a very strong English foundation and was provided with extraordinary accelerated math classes. Having those classes in middle school allowed me to finish Calculus 1,2 and 3 and Differential Equations in high school. The art and music classes taught at Van Avery Prep nurtured my love of music and to this day, art is my greatest stress reliever. I participated on the Van Avery Prep volleyball team and the golf team where I learned personal responsibility and what it means to work together as a team. The encouraging environment I was constantly surrounded by instilled my love of learning. That love was fostered by all the hands-on experiences I was granted during my time at Van Avery Prep. I can remember learning so much from the invaluable science and history field trips we took beginning in Kindergarten and through 8th grade. The confidence Van Avery Prep instills in their students directly correlates into leadership skills that are extremely hard to teach. Whether it be taking charge in a group project or being the president of an on-campus club, I had the confidence in my leadership skills to persevere and that has carried over into my adult life. My best friend is also a Van Avery Prep graduate, which is an indication of the lifelong friendships that are developed there. At Van Avery Prep I was offered a unique educational opportunity that rounded me as a complete individual. I still visit with some of the teachers there as they made a lasting impact on my life. My passion for empowering communities with sustainable solutions to engineering challenges was sparked during my early years at Van Avery Prep. I feel my exposure at Van Avery Prep to hands on learning experiences and perpetual encouragement from teachers, coaches, and classmates prepared me for my college years at Cal Poly SLO, where "learn by doing" was the motto that guided my experience, both in and out of the classroom. I will be forever grateful for the love of learning and the meaningful lifetime friendships I gained at Van Avery Prep, which have helped me grow in my career as an environmental engineer in San Francisco. I hope to continue to build a better world, alongside my resourceful and compassionate Van Avery Prep Alumni, one day at a time. Van Avery Prep helped develop my leadership ability and ignite my passion for learning. I graduated from St. John’s University in Minnesota with a degree in International Business and Entrepreneurship. I am now operating a cross border ecommerce business selling luxury goods direct to consumers in China. I recall that every year foreign exchange students would enroll and attend school at Van Avery Prep. Looking back, I realize going to school with people from a very different culture in an environment such as Van Avery Prep, ignited my passion to constantly learn, connect, and lead. I look back at my time at Van Avery Prep and reflect on how grateful I am for the experiences I had there. From participating in their athletic program to enjoying the Van Avery Prep community, the overall experience doesn’t get much better! Personally, I found that Van Avery Prep best helped me on my life journey by nurturing my individuality. At Van Avery Prep you will never hear a discouraging word from the faculty and no project or endeavor is deemed too difficult. If there is something you’re interested in, the teachers will not only encourage you to pursue your passions, but also actively help in your undertaking. Van Avery Prep provides a unique experience that other schools simply can’t match. They seamlessly blend a rigorous yet fair academic workload with extracurricular activities, creating an environment that helps draw out the best in students. Small class sizes at Van Avery Prep allow students the opportunity for a more personal relationship with their teachers. I found that faculty members were always open to help in any way, creating a comfortable learning environment for their students. Van Avery Prep fosters independence at a very early age and instills leadership qualities in all students. Into high school I really appreciated the strong English and Mathematics foundation I was afforded at Van Avery Prep. While I enjoyed the well-rounded athletics program; my exposure to the arts; and to this day treasure the meaningful lifelong friendships I made there, I think the thing I appreciated most from my elementary school education at Van Avery Prep is the rigorous academics. Their program and curriculum truly challenges students and pushes them to become better learners. I grew up at Van Avery Prep, along with my peers. I know now that their smaller-scaled school setting offered from K-8 was invaluable to my development. The teachers and administration at Van Avery Prep that watched me grow-up throughout my elementary school years, became an integral part of my upbringing. Van Avery Prep provided an environment that included individualized academic instruction. They made every student feel special, which is very important at that age. I realize now how fortunate I was to be able to spend all day at a school that not only offered an excellent educational foundation, but also placed great importance on social etiquettes and real life experiences while promoting the building of lifelong friendships and relationships. Academic expectations at Van Avery Prep were high which prepared me for the next steps in life, but the balance of many extra-curricular activities helped to build my confidence which is equally as important as intellect. Following high school I was accepted to both Pepperdine and San Diego State University. I will graduate in Spring 2018 with a BA in Liberal Studies Mathematics, in the College of Education. I am currently applying to graduate school programs to earn a Master’s Degree while obtaining my teaching credentials. I fondly remember endless opportunities each year in sports, arts, theatrical performances, field trips, assemblies, and family events that made me feel involved and important. I’m now preparing to become a teacher and will incorporate my experiences at Van Avery Prep into my future classrooms. I’m currently a sophomore at New York University studying Anthropology and Global Public Health with a minor in Politics. VAP was a long time ago but I can confidently say that it laid the foundation for what would become my passion and drive for academics. I know that without the academic rigor that was imposed on me at VAP that I most likely would never have done the IB program in high school and most certainly would not be at NYU today. In addition to the strong academics, I think VAP above all instilled in my young self a set of values about education and it’s importance in life. Looking back, I received a great education, a great set of educators that still support me to this day, and friendships that continue to grow. My experience with Van Avery Prep prepared me for high school, college, and the real world. Van Avery is where I met my best friends, their parents who have become my friends, and the incredible teachers who over time have been there and supported me. Van Avery is not just a school in which prepares you for the next level, it is a school that will always be there for you even after you graduate. When my mother passed away the entire community came together and Van Avery is the reason I have a family whenever I come back home to Temecula. I attended UCLA with an emphasis in Musical Theater. I graduated the Theater Film and Television department in 3 years and had enough credits to graduate early. Van Avery’s structure, how they encourage you to grow, push you further than you think you can go, and do it with an honest love is the reason I would happily bring my children to a place I will always call home...Van Avery Prep.